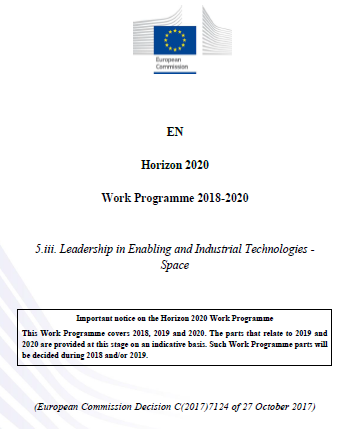 You can download the Horizon 2020 Space Work Programme 2018-2020 in this link: (http://ec.europa.eu/research/participants/portal/). The Horizon 2020 Space Work Programme 2018-2020 will be updated by mid-2018 including details for the 2020 Calls. The associated Guidance documents for the SRC Electric Propulsion topics will be published in due time in this link: (http://ec.europa.eu/growth/sectors/space/research/horizon-2020/).